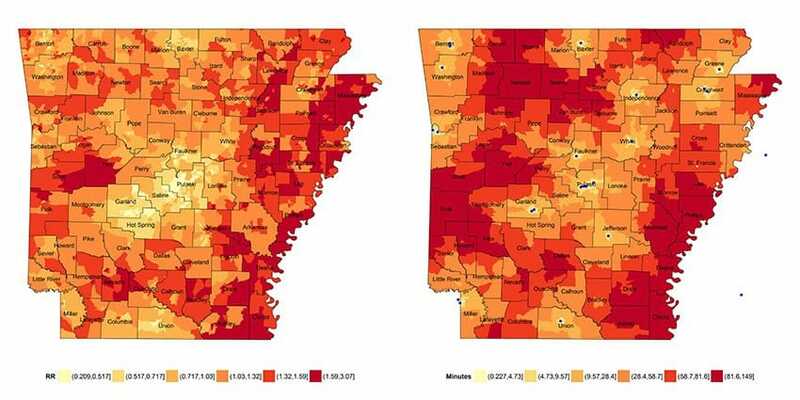 The map, left, illustrates the relative risk of heart attack death among Arkansans older than 30 from 2008-2012. The map, right, shows the driving time from the population center of a Census Block Group to the nearest hospital capable of providing the heart attack care needed. March 4, 2016 | Arkansans’ risk of dying from a heart attack increases the farther away they live from hospitals capable of treating them when compared to state residents who live closer, a new study by Arkansas researchers shows. Their death risk can be as much as 26 percent higher, according to the multi-year study led by Appathurai Balamurugan, M.D., M.P.H., of the University of Arkansas for Medical Sciences (UAMS), and Arkansas Department of Health (ADH). Published in the February issue of the Journal of the American Heart Association, the study was conducted by researchers at the UAMS Fay W. Boozman College of Public Health, the UAMS College of Medicine and the Arkansas Department of Health. It assessed the factors associated with the risk of dying due to heart attack by looking at the smallest geographical unit possible — census block groups. The study is the first of its kind to look at the issue of heart attack care related to neighborhoods at the block group level. Its special focus is on the increased risk of death from long drive times between the population center of a block group and a hospital capable of performing a percutaneous coronary intervention (PCI). Formerly known as angioplasty with stent, PCI uses a catheter to place a small structure to open up blood vessels in a heart that has been narrowed by plaque buildup. The study analyzed 14,000 heart attack deaths in Arkansas during 2008-2012 at the block group level. Data for the study came from the Vital Statistics Branch of the Arkansas Department of Health. Balamurugan, an assistant professor of family and preventive medicine in the UAMS College of Medicine and assistant professor of epidemiology in the College of Public Health, is also medical director for the Chronic Disease Prevention and Control Branch at the Department of Health. Joseph Bates, M.D., deputy state health officer at the Department of Health and associate dean for UAMS College of Public Health, is a co-investigator. “Arkansas is ranked No. 1 in states with the highest heart attack deaths in the United States, and lowering the Arkansas death rate from heart attack is a high health priority for the state,” Bates said. Another co-investigator is Jawahar Mehta, M.D., Ph.D., who holds the Howard and Elsie Stebbins Chair in Cardiology and is a professor of medicine and physiology and biophysics in the UAMS College of Medicine. “Treatment during the first hour of a heart attack is essential and 362,000 Arkansans live more than 60 minutes from a PCI-capable hospital,” Mehta said. Other co-investigators of the study are; Robert Delongchamp, Ph.D., a professor in the Department of Epidemiology in the UAMS College of Public Health; and Lucille Im, M.P.H., Section Chief of Chronic Disease Epidemiology.